The access armamentarium should be simple, yet sufficiently versatile, to achieve the preparation goals. Every dentist who performs endodontic procedures has a preferred set of burs that are used for any given access procedure. Fortunately, only two, three, or four rotary cutting burs are typically required to create an optimal access cavity. Although it is normal for any given clinician to have a specific preference, generally most dentists can agree on a core set of burs. The Endo Access Kit represents a core set of burs that may be used to initiate, progressively open, and completely finish any access cavity within any tooth in the mouth. Diamond Round Burs #2/#4: Use the appropriately-sized Diamond Round Bur with a light brushing action in conjunction with a water coolant to initiate access through tooth-colored restoratives. Transmetal Bur: Use the Transmetal Bur to section or cut through amalgam or any precious and nonprecious metal restorations. Carbide Round Burs #2/#4: The appropriately-sized surgical length Carbide Round Bur provides extended reach and improved vision for extending the access preparation pulpally and de-roofing the chamber. Tapered Diamond Bur: A surgical length Tapered Diamond or safe-ended Endo-Z Bur provides improved vision and may be used to flare, flatten, and finish the internal axial walls. X-Gates (combines GG's 1-4): The X-Gates is used at 500-750 RPM like a brush to cut dentin with its lateral surfaces on the outstroke. Applications include: (1) Open, flare, and smoothly blend the canal orifice(s) to the axial walls; (2) Remove internal triangles of dentin; and (3) Relocate the coronal most aspect of a canal away from furcal danger. The convenient Endo Access Kit provides an economy of burs to initiate, progressively expand, and completely finish any access preparation. 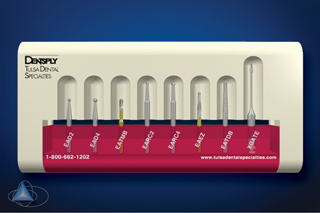 Although only 2 or 3 burs are typically required to access any given tooth, this 8-instrument set is designed to improve your organization, precision and efficiency. Complete endodontic access is essential for predictably successful root canal treatment.